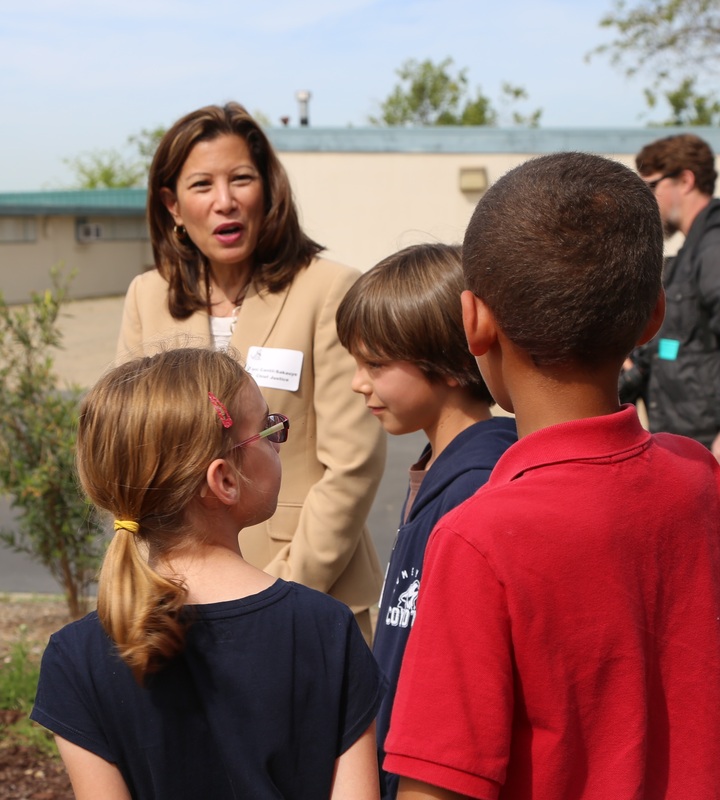 Chief Justice Tani G. Cantil-Sakauye recently visited three California schools earning a Civic Learning Award of Excellence—the highest honor —this year. The Chief Justice conferred the awards at Kumeyaay Elementary in San Diego County; Bellflower High School in Los Angeles County; and Natomas Pacific Pathways Prep Charter in Sacramento County. At Kumeyaay Elementary, 4th graders explained how they designed a school garden that provides vegetables for their lunches while using water conservation methods. Middle and high school students at Natomas Pacific Pathways Prep demonstrated how they conduct their school’s youth peer court, as well as mock trials and moot courts, in the school's mock courtroom. Bellflower High School students discussed their rigorous Civic Inquiries into important community issues, such as low-voter turn-out, and their proposed steps for taking action. Elected officials, parents, school district leaders, local bar association representatives, and other civic leaders added their congratulations at the three well-attended award celebrations. The Civic Learning Awards are part of a collaborative statewide effort, the Power of Democracy, to revitalize civic learning and engagement in California public schools. Co-sponsored by the Chief Justice and State Superintendent of Public Instruction, the awards celebrate schools' civic learning efforts and identify models that can be replicated. The award selection committee, comprised of leaders from law, education, business and civic groups, and judicial officers throughout the state, recognized this year's 87 award winners with visits and letters of commendation.